In the midst of a full day’s search for rare birds on Long Island and in Queens a common bird stole the show, at least for a little while. 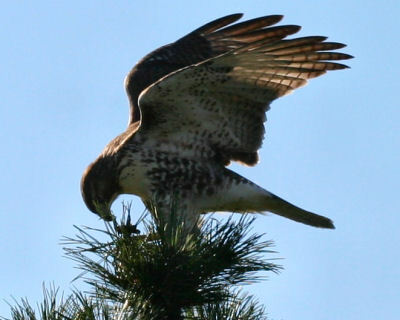 A juvenile Red-tailed Hawk was perched on a pine tree in the median at Jones Beach, being assaulted by Northern Mockingbirds. 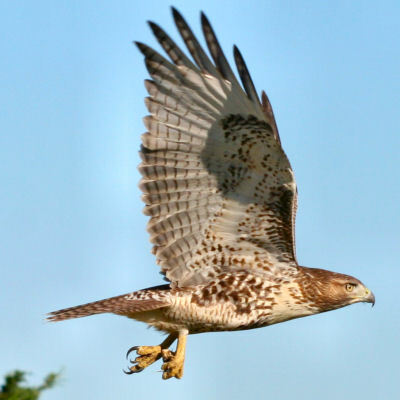 It flew to a second tree where it scanned the grassy shoulders of the road for prey while doing its best to pretend the mockingbirds bouncing off its back were of no consequence. 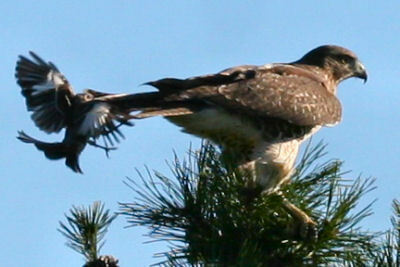 It then glided from the tree to the grass, where it captured and killed a small prey item that was unidentifiable. 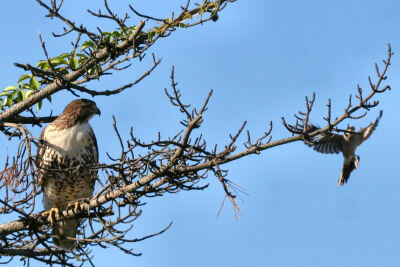 It flew with its snack to the top of yet another tree where it ate, but not in peace, as mockingbirds continued to do their best to drive him away from their territories. 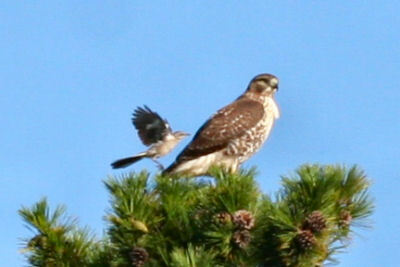 When it flew to still another tree it was mobbed by crows before flying out of sight among the dunes. So what made this young hawk so special? In addition to ignoring the mockingbirds it completely ignored me, allowing for some photography. I may be biased – but GREAT shots Corey! Did you use your Macro lense on these pictures? I’ve got to agree with Charlie and Will… great shots! I love these shots, Corey. 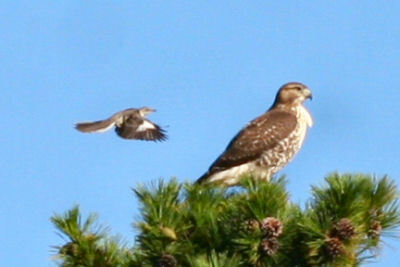 I often see smaller birds harassing crows on the fly, but your hawk seemed to be the picture of patience. Nice pics Corey! I think my favorite is the one where he’s just taking off…that was definitely something to see!! @Aunt Bonnie: He really was quite the stoic. @Christine: It really was quite a sight…and I’d apologize for failing to mention your presence while watching the hawk but you (and the bird you ID’d) will feature prominently in my next post. It seems that even in animal kingdom there is racial discrimination. They are indeed very beautiful pictures of this wonderful bird. 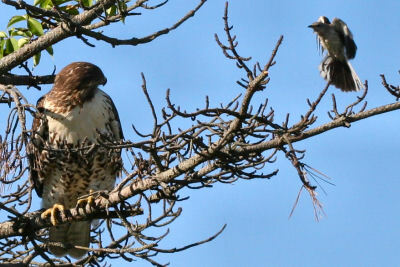 I often seen Red-tailed Hawks along the medians and sides the northern stretches of I-95 and I-495 in Mass. I’ve had some great closeup views of this birds perched in trees or gliding over the highway, but these shots are magnificent. @Armand: Not so much racial discrimination as the mockers didn’t like the idea of a virtual killing machine hanging out on their turf. And thanks! @Paul: Thanks to you too…some of the best birding experiences I’ve had were on the side of a road, because of the visibility and the edge habitat. yes, awesome pics! 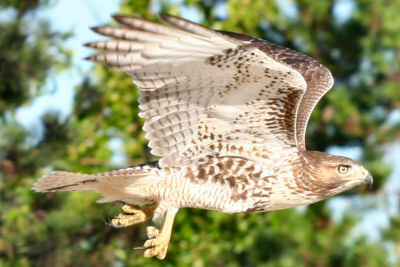 i love your red tailed hawk shots the most. you bring out the best in nauture keep it up! Hey i love the pics this is june so ive seen some juvenilles in this cow field beside my house there beautiful i first noticed when i saw like 3 red tails after i have spent some time watching there nesting tree nice pics i love how these birds are so versatile to our human way of life something i wish would change but im glad they can live through with us. Thanks a ton for the uploads! Fantastic shots and good camera work. What an amazing series of photos. Thank you for sharing them. These photos are great! 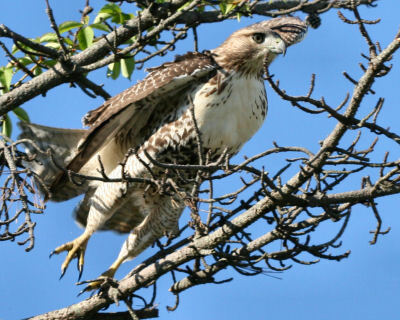 I just saw a pair of these hawks at Stony Brook and your pictures further enhanced my relatively short birdwatching experience. Thanks! Thanks for your awesome photos!! 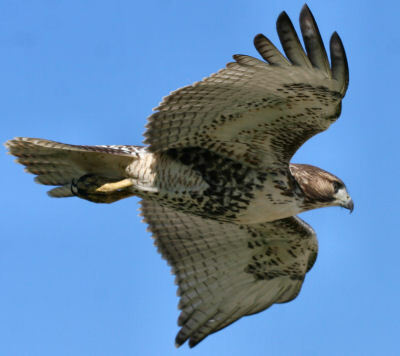 My son is presenting on these majestic birds for his 4H wildlife management project and your images are a perfect addition. Thanks!! i like birds i see them all the time were i hunt. 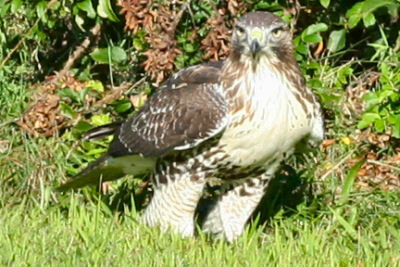 Thanks, your photos help me identify a juvenile red tail hawk that caught and killed a medium sized cat, that I took 4 pictures of ! How or where should I posted them ? Interested on your site ? Thanks for helping me identify the unexpected visitor to my backyard bird bath. Kinda unexpected in the middle of a city (Houston, TX) with over 5 million people. Large nest in a big live oak tree a few streets away in our little inner-city subdivision.